Coming to Cinecittà World, Rome’s amusement park dedicated to the wonderful world of cinema, is a very special guest: famous mouse journalist Geronimo Stilton, whose books have been translated into 47 languages, and who will be opening a new home on Cinecittà Street to meet all his little fans. 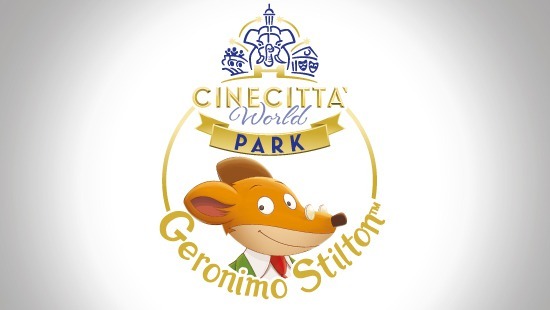 The opening event will be held on June 3rd when Geronimo Stilton in fur and whiskers makes his debut at Cinecittà World and welcomes all his young visitors and their families for the very first time. The ribbon cutting ceremony will take place at midday on the dot, with a big welcome party organized for the occasion to officially kick off Geronimo’s first adventure in an amusement park. Starting from June 3rd until November 1st it will be possible to visit the house of the Editor of the Rodent’s Gazette and enjoy “Geronimo Stilton. A Fabumouse Exhibition”, the exhibition containing an extensive collection of original drawings and illustrated tables which tell the story of the most famous people and places on Mouse Island. It will be a fabumouse surprize for Geronimo Stilton’s young readers to know that he will also have a house in Cinecittà World to go to on his frequent visits to the city. The bright yellow walls recall the typical style of the mouse journalist’s house in New Mouse City: the desk with the typewriter that was a gift from Grandpa William Shortpaws, a comfortable armchair to sit and read an exciting novel, maps of New Mouse City and Mouse Island hanging on the walls, along with the most important awards received during his career, as well as a large selection of books. The famouse journalist’s house can be visited every day when the park is open and Geronimo Stilton, in the company of his sporty, bubbly and breezy sister Thea Stilton, and his sensitive, intelligent nephew Benjamin, will meet his little fans every afternoon from 4pm to 5pm. Furthermore, in the store inside the Park there will be a themed corner dedicated to books and gadgets for the joy of all his dear little cheeses! The project for the opening of Geronimo Stilton’s house in Cinecittà World was devised by Atlantyca Live – a division of transmedia company Atlantyca Entertainment, International IP rights holder of the Geronimo Stilton brand – dealing with devising, planning, producing and developing live entertainment properties belonging to Atlantyca which include, among others, the Geronimo Stilton brand and spin-offs. Designed by three-time Academy Award winner Dante Ferretti with a soundtrack penned by Oscar winner Ennio Morricone, to whom the western area of the Park is dedicated, Cinecittà World offers its visitors an extraordinary experience which merges cinema and amusement: exciting, new, adrenaline-pumping attractions full of special effects, film sets, high-impact performance theater, and high quality themed restaurants. Cinecittà World is the perfect place to blend cinema, culture and fun. And from now on all the more so thanks to Geronimo Stilton’s house!